So how did everyone use their extra hour this weekend? Mine was spent sleeping aka recovering from a little cold and another Penn State loss. And don't even get me started on the crap that is the AP Poll! I'm interested to see what the committee brings us tonight with the updated playoff rankings. A must for my disgustingly dry skin. I love the light, fresh scent and it helps my concealer stay on all day, which is also a must. Again with the dry skin! I discovered this in a Sephora skincare sampler last fall, and I can't get enough. I keep it in my desk at work and spritz it all over my face and then bounce a beautyblender all over to pat it in. Does this really tighten up skin? Who cares! It smells like the most incredible beach vacation and never fails to make me smile when it's cold and dark outside. The first time I saw someone post about these I'm pretty sure I thought "Are you joking?! Ten dollars for cotton pads?" but they're so worth the money. One pad can remove my eye makeup or nail polish and they don't come apart in wispy little strips of cotton. And they're so soft! What is a sale for if not for trying something new? This organic brand by Miranda Kerr sparked my interest, so I put it in my cart to try. It contains a cleanser, moisturizer and spray. Here's to hoping it's a good purchase! Five on Friday | tv, clothing, makeup, oh my! Happy Friday, friends! This week has been a really rough one; work has been crazy and I'm SO GLAD we are so close to the weekend. Maybe it'll arrive faster if I hurry up and get along with my five on friday? Let's give it a try! So we don't have cable, but I did download the Bravo app and have been bingeing episodes of Below Deck. I was never really into this show back when we did have cable, but I'm borderline obsessed with Kate, the chief stew from the show. Her clapbacks are hilarious, and based on my creeping on her twitter, she does some amazing volunteer work. I need to be her friend! 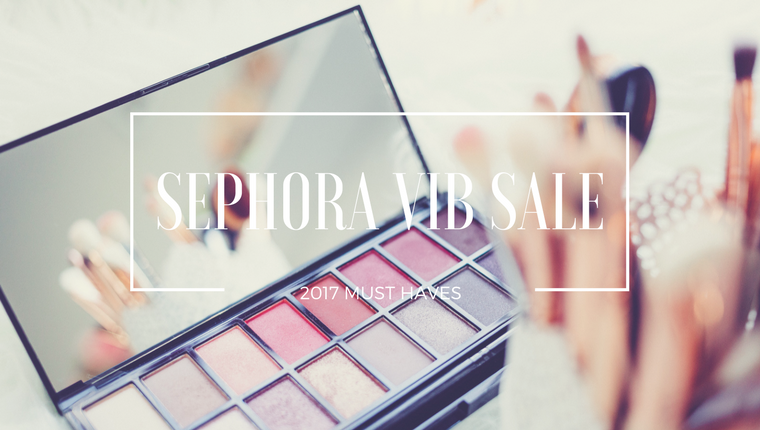 It's that time of year, aka the day I spend all of my money at Sephora's VIB Rouge sale. I typically shop at Ulta because they have a much better rewards program, but there are a handful of items that are only available at Sephora so I'm filling up my cart today. I'll report back with what I got when it arrives! The battle of the land grant universities! Tomorrow #7 Penn State takes on #24 Michigan State in East Lansing. I'll be watching the game at the Vineyard at Hershey at the Junior League's tailgate fundraiser. Penn State football, friends, and wine...if Penn State wins, it will be the perfect Saturday! I hope everyone has an amazing weekend - I'm counting down the minutes until I'm out of the office and relaxing. Cheers!